The final NASTE race of the 2010 season was held Saturday, June 19 on the Hemi Heights Raceway at Jeff Courtney's in Portland. The Heights is a four lane, wood-routed track. Featuring a fast, flowing layout - the action is always intense! A super group of fourteen racers showed up to race the cars of the night - 1:24 scale Flexi's in two different flavors. Jeff Courtney prepared eight cars for the final race which consisted of two sets of heat races. In each set of heat races the racers had an opportunity to race a different class of car. 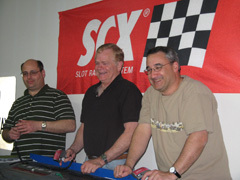 In the first set of heats Flexi chassis type cars with 16D motors were raced. The heats were two minutes long, and these cars proved to be quite fast and challenging. The second set of heats brought out the.... well, we'll just refer to them as "The Evil Ones". These cars were SO FAST it was a challenge just to keep them from launching off the track! Point series points were awarded based on the racer's best finsih in either set of heat races. At the end of the chaos it was Bryan Trachsel in the winners circle (in BOTH sets of heats). Thanks to Jeff Courtney for taking the time and effort to put together the eight cars we totally abused, and for putting on such a great race event! Jeff you are the HotDog Meister! The seventh NASTE race of the 2010 season was held Saturday, May 22 on the Autumn Hills Raceway at Rico, Kelly and AJ Locati's in Milwaukie. The Hills is a 50 ft. two-lane Scaley Sport track with copper tape. Its tight layout and hairpin squeeze always provides close competition for racers of all levels. A super group of twelve brave souls showed up to race the cars of the night - SCX Corvettes. The very same Corvettes that Rico had just completed the Beaverton season with - they were tuned to perfection. The timer was set to three minutes, the tires were cleaned, and off they went. After the first set, 4 drivers were on the lead lap with two more just behind. It was shaping up as the closest race in NASTE memory. Storming out of the gate in the second set of heats was Bill Bostic. He ran a withering set and took the overall lead until Rico got it going to take the overall lead. Both the postman and the Big Smooth gave it a hard run but it looked like victory for Rico until the final heat when Rico's son AJ put the hammer down to come on strong and claim his first NASTE victory. The sixth NASTE race of the 2010 season was held Saturday, May 1 on the Autumn Hills Raceway at Rico, Kelly and AJ Locati's in Milwaukie. The Hills is a 50 ft. two-lane Scaley Sport track with copper tape. Its tight layout and hairpin squeeze always provides close competition for racers of all levels. A super group of fifteen hearty and hungry racers showed up to race the cars of the night, Ninco DTM's and the furious, flying Ninco Fiat's. The cars were non-mag and had been tuned by track-master Rico. Heats were three minutes in length. Apparently memory really is the last part of a guy to go soft as Monte "the Big Smooth" Saager drove the track like he owned it. Truth be told - he actually did since he is the former owner and builder. He was able to scoot the Mercdes DTM's around the track a little faster than the rest resulting in a first place finish, followed by Flyin' Bryan Trachsel in second and home-track favorite AJ Locati in third. Just three tenths off the podium was new track owner Rico - apparently the curse of the hillshas been passed on. For a second set of heats, Rico chose the Flying Fiats of Fate! Since we use different cars for each set, this brings us to what we refer to as the Full Montescoring system. Drivers are awarded a result equal to their best finish in either of the two sets. So now all the drivers get another shot at improving their position. There was also another full Monte - me - right after dinner. Rico's wife Kelly laid out a spread of Mexican food that had to be seen to be believed. There were Tacos, Burritos, Enchiladas, and much, much more. Kelly's friend Brenda also brought a wonderful red cake and Dorothy, our favorite "Hammer" Abbott brought little sugar-free cheesecakes and chocolates. It was easily the best NASTE food night ever. Back at the track, it was once again the Big Smooth piloting the Fickle Fiats of Fate faster than the others. He credited his smooth approach for reducing the wheel hop that was a problem for some. Nipping at his heels was once again Flyin' Bryan followed closely by Jeff Courtney. Just off the podium once again was the now-cursed Rico. We'd like to extend a huge thanks to Rico, Kelly, and AJ for providing another great night of racing and fine food. Round five of the NASTE 2010 Scrabble Championship got underway as Victoria once again chaired the Scrabble table. And once again they played the game "Upwords" where rather than typical scrabble, tiles can also be played vertically to change words. Two rounds were played in a tense, tight competition with Victoria Saager winning the first and AJ Locati the second although I hear there may have been many hands at work. 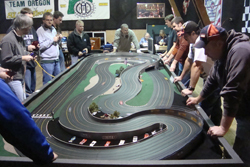 The fifth NASTE race of the 2010 season was held Saturday, April 17 on the Jacquelin Park Speedway at Monte and Victoria Saager's Li'l Slot Car Heaven in Hillsboro. The Jacque is an SCX Digital track with multiple cars on the same lane and fuel management. Actually management is the key word here, as in managing the insanity! With 6 cars zipping around a two and sometimes three-lane track it can get pretty wild. It's the NASTE way. A field of ten brothers and sisters of the slot came together to have at it with a mix of digital Ferrari's, a Corvette, an Aston Martin and even a pesky Seat Cupra. And have at it they did. At times the track looked more like a destruction derby than a race. Cars flew, guides popped loose, it was out of control. The best you could hope to do was manage well amid the mayhem. Frankly, it was a ton of fun. And for one night the postman truly delivered. Turning in the top performance on the track as well as managing amid sheer chaos was our favorite mailman - Terry Abbott. His point total of 29 just edged out AJ Locati and host Monte both tied at 28. For the second set of the night the racing action shifted over to the Penguin Point analog track featuring a pair of NSR Mosler's and an NSR 917. These cars are quite popular in the European racing circles and it was great fun to get them out on the track for a run. Turning in the top points totals for the second set was Randy Stumman and with host Monte tied with 13 points while Bryan Trachsel zipped to a third place finish with a score of 11. Amazingly enough, all the other racers were tied with 7 points. And that proved to be a huge benefit to them all as our full-Monte scoring system awards points based on your best finish. It's a nice opportunity to overcome the madness of the Digital track. We'd like to extend a huge thanks to Monte and Victoria Saager for providing another great night of racing and fine food. And there were great chocolates from the Hammer, and cookies! Yum! 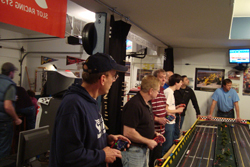 The fourth NASTE race of the 2010 season was held Saturday, March 6 on the Penguin Point Raceway at Monte and Victoria Saager's Li'l Slot Car Heaven in Hillsboro. The Pen is a three lane MDF-routed track with magna-braid and with its tight layout provides close competition for racers of all levels. A great group of twelve hearty racers showed up to race the cars of the night, SCX GT's, in a classic duel of Ferrari vs. Chevy vs. Porsche. The cars were non-mag with RX-42B's running at 12V. Heats were two minutes in length. After the first set of heats Bill Bostic was clinging to a one lap lead over the field with 5 drivers nipping at his heels just a single lap behind. It should be noted that there are no tenth markers at the pen, we count full laps only and drivers rotate through the lanes in order moving their car from where it stopped to the next lane. At the conclusion of their three heats a dot is placed to mark the final stop location. And although we run two sets of heats, the result is based only on your best set of heats. By the end of the evening it was so tight that the top 8 were all within two laps and results were based on whose dot was furthest along the course. Most drivers were able to manage at least 12 or 13 laps per heat but only 4 were able to reach the magic 14 lap barrier- the top 4. In the second set Flyin' Bryan was able to squeeze out the win but just barely - it truly came down to feet. We'd like to extend a huge thanks to Monte and Victoria Saager for providing another great night of racing and fine food. And Dorothy Abbott brought some more of her great chocolate treats! Yum! Round three of the NASTE 2010 Scrabble Championship got underway as Victoria once again chaired the Scrabble table. This time they played the game Upwords where rather than typical scrabble, tiles can also be played vertically to change words. Two rounds were played in a tense, tight competition with Victoria Saager winning the first and Sue Gillean the second although I hear Len Gillean had a hand in both winning efforts. The third NASTE race of the 2010 season was held Saturday, January 23 on the Kodiak track in the stunning Brystal Barn of Bryan Henden. The Kodiak is a high-speed HO track with continuous rail. A fabulous track in a great location - it was a treat! A great group of twenty-one racers showed up to race the cars of the night - HO something-Jets. They had magnets and they were fast. Real fast - and amazingly sturdy considering the NASTE beating they took. In fact once a car did de-slot it was like a trip through pinball alley as other cars would hit it tossing it a good two feet into the air only to be smacked again by the next car by. Fast and very furious! By the end of the evening it was clear that the HO Pro's had soundly whipped the Nabobs of NASTE with Dave Rothwell leading the way followed closely by Jim Mitchell and Andre Perra. We'd like to extend a huge thanks to Byron Henden and Andre Perra for providing another great night of racing and the food was great too. I loved the meatball subs. On the Scrabble scene, round two of the NASTE 2010 Scrabble Championship got underway as Victoria once again chaired the Scrabble table. Three rounds were played in a tense, tight competition with Dorothy Abbott winning two of the games and Victoria Saager the third. Here's a link to video by Dorothy the Hammer! The second NASTE race of the 2010 season was held Saturday, January 9 at the Stummans' Marshall Field Raceway in Beaverton. 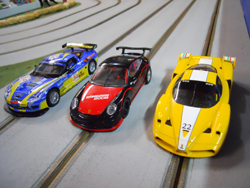 Marshall Field is an 80 ft. 4-lane Scalexrtric Sport track offering great racing for 1/32 scale cars. A great group of nineteen racers showed up to race the cars of the night - SCX Nascars. We've run the SCX Nascars plenty in the past and once again they showed to be excellent runners providing close competition. These cars are not only hard to pass in the turns they can be tough to pass in a straight line. And they're all just about the same speed. This makes for some great racing. And close it was with more than half the field within 5 laps of the leader! Just squeaking out the win with an outstanding first run was home-track favorite Randy Stumman. Following close behind were the dueling Bryan's - Trachsel and Henden. We'd like to extend a huge thanks to Randy and Myrna Stumman for providing another great night of racing! The NASTE 2010 Scrabble Championship got underway as Victoria chaired the Scrabble table. Two rounds were played in a tense, tight competition with Sue Gillian winning the first game and Kathy Voigt winning the second. Amazingly, all players ended the night tied for first with 17 points. NASTE is all about close competition and that even extends to the Scrabble table! Be sure to join us for the next race on January 23rd in Canby. Well be racing HO cars. See you there. The first NASTE race of the 2010 season was held Saturday, November 14, at the Jeff Courtney?s Hemi Heights Raceway Park in northeast Portland. Hemi Heights is a 4-lane wood-routed track offering great racing for 1/24 scale cars. A great group of fourteen racers showed up to put the NASTE '55 Chevys through their paces. The NASTE Chevys are not extremely fast (being powered by RadioShack motors), but they are challenging and fun to drive! It?s fender slapping at it?s very best in the true NASTE tradition. The racing proved to be very close and as the evening progressed, Jake Courtney came out on top to claim the win just squeaking by Dad Jeff. Thanks to the Courtney?s for a great night of racing!